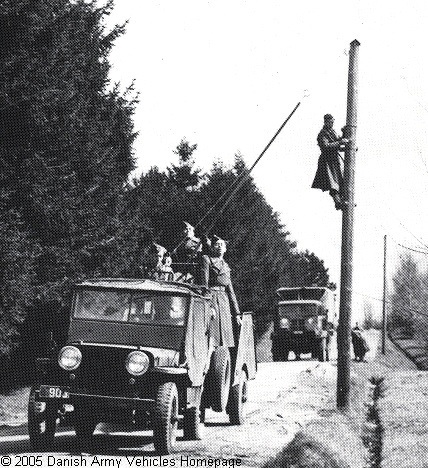 Danish Army Specific: Around 1947 an unknown number of vehicles was acquired. The shown vehicle was used as cable layer by the Signals. In the background a Ford WOT6. Historical: Development of what was to become the CJ-2A began in December 1944 and 1 CJ-1 and 40 CJ-2 prototype vehicles had been made. Neither models came into production. The differences from the wartime Willys MB included strengthened transmission and clutch, a hinged rear tailgate and 7 inch sealed-beam headlights. The OD colour had gone and the body was available in grey, blue, tan or brown gloss paint. A brief flirtation with the name "Agrijeep" took place but the name was never adopted, and the new vehicle was marketed as the "Universal Jeep CJ-2A". Quantity production of the CJ-2A took place from July 1945 and when it ceased in 1949 close to 215.000 units had been made. Length: 3.35 m (130 inches). Width: 1.54 m (60 inches). Height: 1.80 m (70 inches). Weight: 1.625 kg (3.575 lb.). Engine: 4-cylinder (Willys 442 L-head), 2.200 cm3 (134 cubic inches) displacement, carburettor, liquid cooled. Horsepower: 63 at 4.000 rpm. Transmission: 3-speed, Warner type T-90. Transfer case: 2-speed, Spicer Model 18. Electrical system: 6 volt, negative ground. with deep water fording kit: N/A. Fuel capacity: 40 liter (9 gallons). Range: 425 km (265 miles).